Integrated Muting functions enable continuous material flow, e.g. for automated production cells or packaging stations, while maintaining the protective function. The protective device assumes the control here of the Muting indicator and in the event of a fault in the Muting sequence guarantees the safe exit of the material to be conveyed out of the Muting line. With the configurable MSI-m Safety Relays, highly productive Muting solutions are very easily implemented in combination with safety sensors. MSI-m is a configurable MSI Safety Relay type 4, in accordance with IEC/EN 61496-1, and as the link between the opto-electronic protective devices and the machine control system is equipped for numerous Muting function types: be it Sequential or Parallel Muting. The MSI-mx version even enables Double Parallel Muting for entry and exit areas and the integration of several additional safety-related components, such as E-STOP control devices or protective door switches. This extremely compact combination can also further reduce the costs with the implementation of Muting processes. 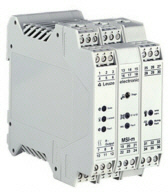 Purchase your Leuze MSI-m/R, MSI-mx/Rx Configurable Safety Relays today!